Telling the Bees at Artscape, July 2014. Watch the video below. Telling the bees is a single-channel, looping video installation developed during an artist residency at Artscape Gibraltar Point, Toronto Islands, Ontario in June-July 2014. Building on my earlier performance, Tell the Bees, this work interprets the tradition of telling the bees when a family member has died. My exploration of bees and beekeeping coincided with my father's diagnoses of cancer and subsequent death in May 2014. 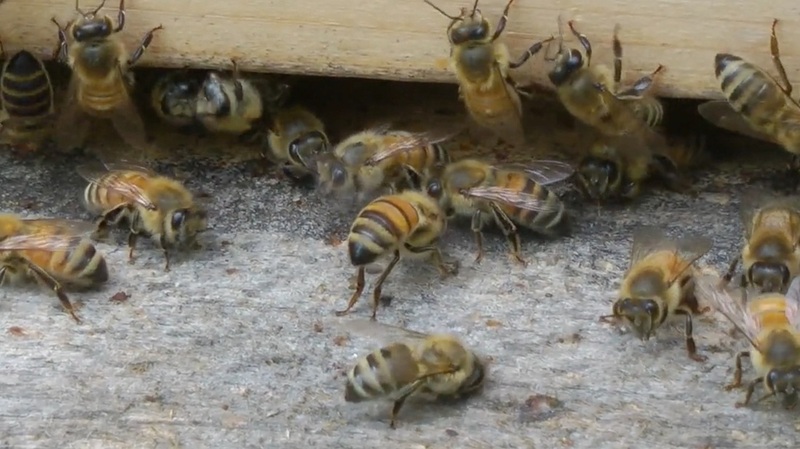 In this video, I paid tribute to my dad by following the old ritual of draping my beehive with black cloth, knocking three times on the ground to tell the bees that my father had died, and asking them not to abandon me in my grief. The video was first presented as an installation as part of Art Into Life, a culminating exhibit for the residency at Artscape. 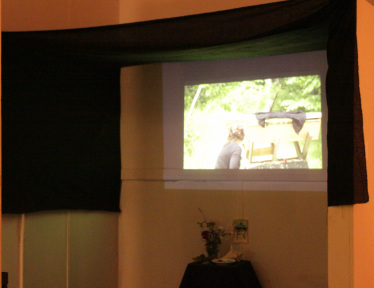 A small viewing booth echoing the draping of the hive was created with black cloth, and a small alter of offerings, like those traditionally placed by the hive, was set below the screening area. There was a wooden bench inside the booth, and the 2-minute video played on loop, the soundtrack filtering out and interacting with the other reflective works of the exhibit. Telling the bees was presented again at the Vergette Gallery at Southern Illinois University in September 2014, and at the Hughes Gallery as part of my MFA thesis exhibition, Honeybee Collectives, in March 2015.